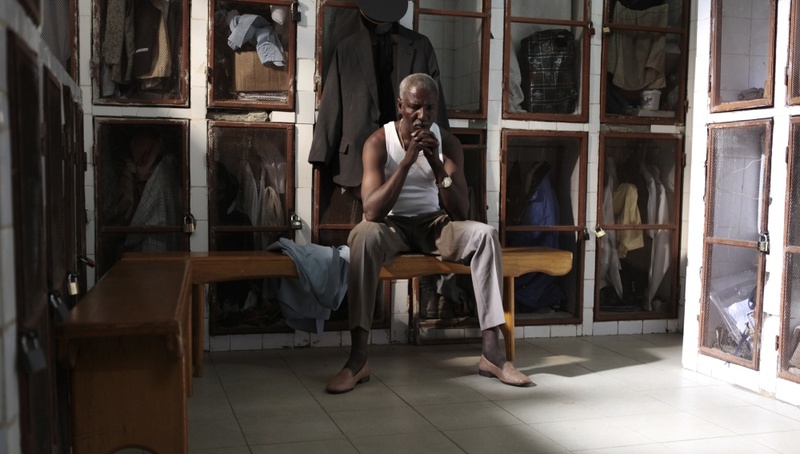 A Screaming Man is Mahamat-Saleh Haroun’s third film about fathers, sons and conflict. Unlike the two earlier films, Abouna and Daratt, this new film features the war in Chad directly. Civil wars have been a feature of Chadian life since soon after independence. Since 1965 there have been only around 19 years of ‘peace’. Chad’s wars are connected in various ways with wars in Sudan and the Central African Republic. Since the third regional player in Chad’s affairs is Libya, Chad is in a very unfortunate position in the ‘dead centre’ of Africa. France held Chad as a colony for just 40 years between 1920 and independence in 1960. 1,000 French troops are still in the country, supporting the present regime in its fight against ‘rebel insurgents’. Mahamat-Saleh Haroun is a Chadian by birth who now lives in Bordeaux but visits Chad regularly to make films. He has an arrangement from his previous film Daratt which provides a Chadian producer on the ground and a Belgian partner for the French company he worked with this time. With a host of other soft money sources the production rustled up €2 million for a six week shoot. The result is a visually stunning ‘Scope production. It has a very simple story which is powerfully told (and performed). It is, however, accessible on many different levels, some more difficult than others and aspects of the film’s narrative still puzzle me. Adam is a man in his late 50s still working as a swimming pool attendant in a western hotel in N’Djamena, the Chadian capital. His friends call him ‘Champ’ since he once won a Central African swimming championship. Adam’s 20 year-old son Abdel works with him and enjoys teaching swimming to children. Adam’s only immediate problem is that the local ‘chief’ of his community is pressurising him into making his contribution to the funding needed by the regime in power to fight the rebels threatening the city. Adam has no money, but he knows that the chief has already been forced to send his own son to fight in the civil war. But then Adam is called in to the hotel office to learn that the Chinese owners of the privatised hotel have decided that his son can do the swimming pool job and that he has been demoted to attendant on the hotel gate, letting cars in and out. Adam is devastated. The pressure from the chief is still there and we aren’t too surprised when the Army come to take Abdel, telling him that he is drafted. By this stage Adam is barely speaking to anyone. What will he do when Abdel’s pregnant girlfriend turns up? The film’s title is taken from a poem by Aimé Césaire, born in the French colony of Martinique and one of the founders of the Négritude movement – the promotion of Black culture through the intellectual and cultural life of Francophone Africa and the Caribbean. The supporters of Négritude see it as an anti-racist and anti-colonialist movement validating African identity, but the great Senegalese writer and filmmaker Sembène Ousmane was opposed to it, particularly as advanced by the Senegal President at the time of independence, Léopold Senghor. Sembène saw the movement as backward-looking and subservient to Francophone culture in Africa. It’s significant, I think, that whereas Sembène, once able to make his films without a controlling French producer, always sought to make his films in local Senegalese languages, Haroun’s characters generally speak French and Arabic – the ‘official languages’ of Chad. Apart from anything else, this makes class positions difficult to determine. Adam is broke but he runs a motorbike and sidecar and has a house and yard. Is he working class or is he privileged in this society? The meaning of this seems reasonably clear. We are being urged not to be spectators of misery but to become involved. At least that’s how I read it – other interpretations, especially by those who know the poem, welcomed. I seem to remember reading that Haroun has said that Adam is ‘screaming’ at God for not intervening in the tragedy that is befalling his family. I’ve read several reviews that suggest that Adam ‘sold’ his son to the Army to get his job back. I don’t buy that. Adam is devastated when he loses his job and devastated further when he realises that he will lose his son. As often happens, I think it depends on who you identify with in these stories. If you are older you are bound to feel more keenly for Adam. As the gatekeeper in a uniform far too small for him, Adam is reminiscent of the figure played by Emil Jannings in Murnau’s The Last Laugh (Germany 1924). 55 in many poorer African states is an age beyond the average life expectancy. The African world is for the young (which makes their sacrifice in war even more terrible). Haroun shows this in many ways but perhaps most powerfully simply by taking away the power of speech from the father. I enjoyed the film very much and I’m glad that Haroun is able to make films that get an international release (and in this case a Cannes Prize in 2010). He and Abderrahmane Sissako are the only African directors who have regularly had their films shown in the UK in the last few years. I think that a couple more titles by directors from elsewhere in Africa are going to appear soon. Much as I admire Haroun’s artistry, I hope other titles also refer to contemporary African popular culture. If I have one criticism of Haroun it is that the women in this film are almost completely marginalised. That’s a shame, especially as the welfare of pregnant women in Chad and the high levels of mortality of both babies and mothers during childbirth is something that has been recognised in Europe. So if you go and see this film (and you should), how about also giving a donation to ‘Safer Birth in Chad‘? See also our entries on Daratt and Bamako and on an earlier report on A Screaming Man at Cannes and African Cinema Now. This entry was posted in African Cinema and tagged Chad, négritude. Bookmark the permalink.